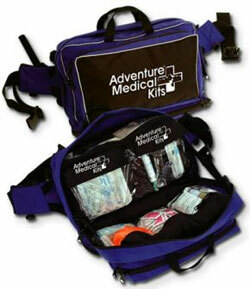 This kit is designed to be used by rescue professionals trained as Paramedics, Wilderness EMT or Wilderness First Responders. Kit upgrades include blood pressure cuff, oral and nasal airway kits and enough supplies for a month long expedition for a large group. 2 Dressing, Burn, WaterJel, 4" x 4"
1 SAMÃ‚Â® Splint, 4" x 36"
Designed for outdoor professionals with either Wilderness Emergency Medical Technician (WEMT), Wilderness First Responder (WFR) or Wilderness Advanced First Aid (WAFA) certification.